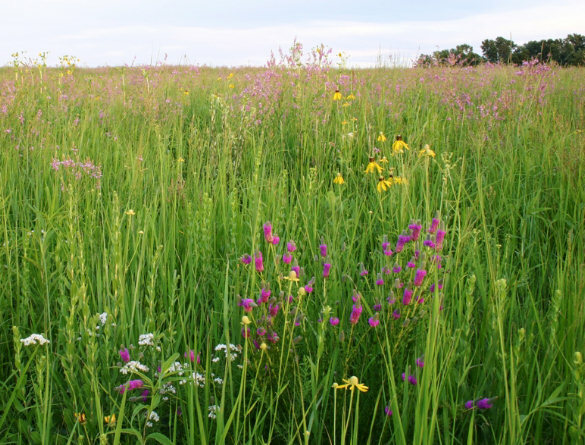 This roadside prairie tour is part of an educational program initiated by the Iowa Valley Resource and Conservation Development (RC&D), focused on the celebration of the cultural and natural heritage of plants native to the Iowa River Corridor. The Iowa Valley RC&D recently created a poster titled, Heritage Plants of the Iowa River Valley. The poster is another tool to educate area citizens about the importance of native vegetation. 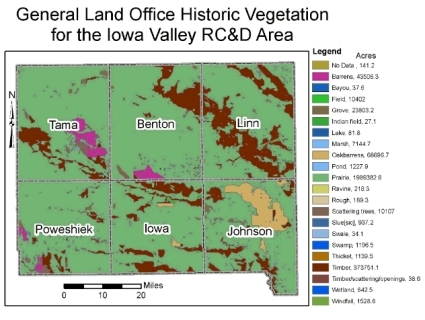 The Iowa Valley RC&D has completed roadside inventories of Tama, Benton, Iowa, Poweshiek and Johnson Counties, and is presently working with Linn County on an update. Each county has remnants worthy of celebration and preservation. The goal of this project is to actively inform the traveling public, so that roadsides may be equated with the preservation of our tall grass prairie heritage. Travelers and area residents will learn how much of the county's remnant natural resources are located in the roadsides, and how necessary an IRVM program is to not only the remnant resources, but to all the associated benefits that an IRVM program offers www.uni.edu/irvm/. The roadside prairies on this tour were once part of a larger pre-settlement landscape. The counties included in this tour are typical of Iowa, in that only a tiny portion of the once vast tall grass prairie remains in each of them. The roadsides are some of the last harbors of prairie. Plan your visit ... Each county has its own page, with an interactive map. To select a particular site, click on its name on the map, or on one of the navigation buttons on the left. Each prairie tour site has its own page, with a map and directions for locating it. 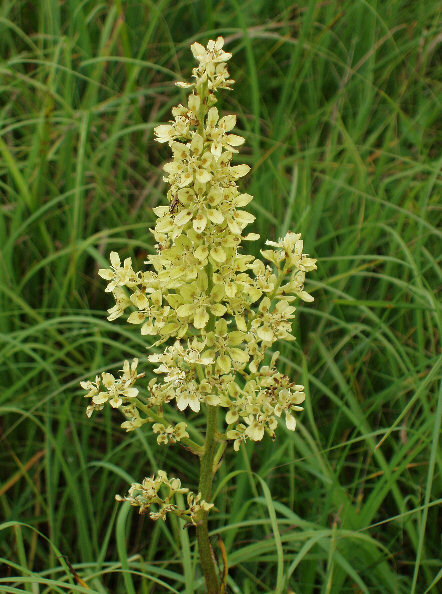 Each page also contains a plant list, including both the scientific and common names of plants that have been observed in these areas during floristic surveys. Non-native species are designated on the lists by being typed in all capital letters. The plant lists include a "coefficient of conservatism" value from 0 - 10, "weedy" to "conservative." 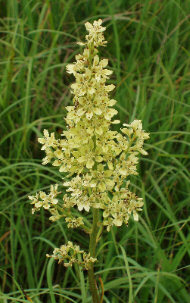 Plants with higher values are generally restricted to highly diverse remnants. These rankings are the numbers to the left of the scientific names, under the heading "C" (Drobney et al, 2000). The plant lists also contain the national wetland categories, which are located to the left of the "common name" column under the heading "W." These rankings, from -5 to 5, reflect the typical wet environment that supports this plant. 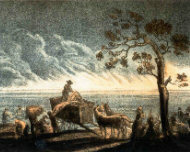 A ranking of -5 indicates that the plant grows in drier conditions, while a ranking of 4 or 5 would indicate that the plant is obligated to the wettest conditions. When making your visit ...Be extremely careful when stopping along these roadsides, as they serve as state and county transportation. Pull completely off the road. Be aware of other traffic when crossing the road. Please respect private property. Railroad right of ways (ROW) are owned by the railroads, and often have "No Trespassing" signs posted. Enter railroad right of ways at your own discretion. Please respect the integrity of these sites and do not remove plants, seeds or flowers; take only pictures and memories away from your visit. Obey the speed limit and wear your seat belt at all times. When driving, please watch for pedestrians, bicycle riders, snowmobiles and seasonal farm machinery. Have a safe, accident-free tour of the Iowa River Corridor and its unique native heritage and scenic history. All photographs on this site are used here by permission of the photographers, who retain copyright to these images. Photographs should not be copied and/or reproduced without the permission of the photographer. 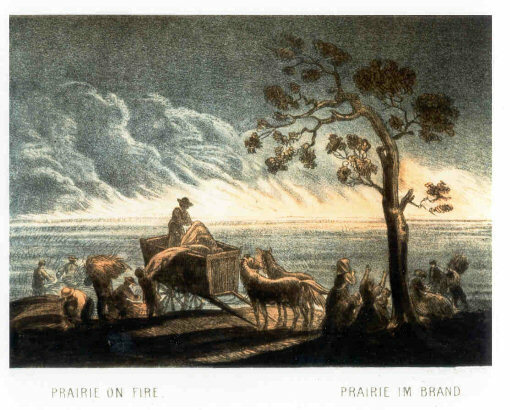 Praire Fire "Prairie Fire," an 1857 lithograph by Henry Lewis, Collection of the State Historical Society of Iowa.